shinfin™ leg fins match elite freestyle (front crawl), butterfly (fly) & backstroke techniques. These swim technique fins help you develop better, faster freestyle, butterfly & backstroke. + Elite freestyle, fly & backstroke. + Streamline, strengthen whole stroke. + Better kick for stronger arm pulls. + Efficient breathing timing technique. + Natural, streamlined kick from hips. + Thighs, buttocks & stomach power. + More power from up & down kicks. + Ankles & feet stay relaxed & supple. + Fast, medium, slow kick techniques. + Adjust fin angle & height to kick. + Leg fins guide your swim technique. Fins that help improve swim technique. Your ideal swim technique fins? Are you a good to elite swimmer looking for swim technique fins to improve your power and speed? Are you looking for improvements in your kick, streamlining and arm stroke efficiency? shinfin™ leg fins can help to improve your swim techniques for freestyle, backstroke and butterfly (they are not designed for breaststroke). To avoid damaging an already good swimming technique, your swim technique fins must “feel right” when you swim with them. All your body movements (arms too) should be similar with and without your fins. You should use the same muscles, in the same muscle sequence as your natural stroke. Your good swimming techniques should still be there as soon as you take off your fins. This tells you that your swimming fins are working with your natural swimming technique. 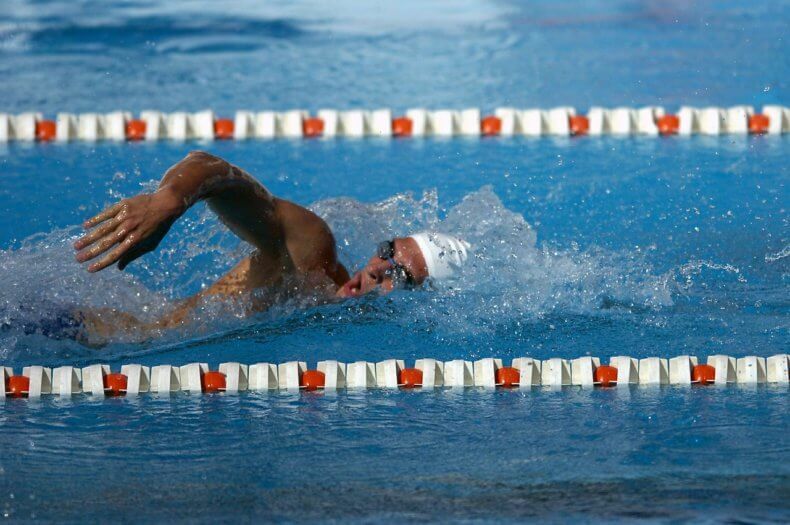 You should not have to swim laps to recover your natural swimming stroke like you do after taking off foot flippers. To improve your swimming, your swim technique fins must do even more. They must match and enhance the swimming techniques of good/elite swimmers. They must help to optimise your horizontal, efficient body position and natural streamlined kick from your hips. They must help to improve your kick efficiency using power from your thighs, buttocks, stomach and torso – the correct muscles that good/elite swimmers use. They should continue to “feel right” when you swim slower (perhaps to work on your upper body technique), or swim faster (perhaps with a higher beat kick). Whatever your speed, your swim technique fins should guide your strokes to become smoother, more streamlined and more efficient. You should feel improvements as soon as you take your fins off and immediately swim without them. Then you know your fins are enhancing your natural swimming technique. I have designed shinfin™ leg fins to provide all these benefits and more, for improving freestyle, backstroke and butterfly swimming techniques. They achieve this by connecting power directly to your legs, above your ankle joints. This means that your feet and ankles are free to move naturally (not strained like with foot flippers). Your kick power comes from the correct muscles in your thighs, buttocks, stomach and torso. They help to keep your body horizontal and improve your streamlined kick, stroke efficiency and speed. You can even adjust the fin position on your leg to suit your swimming technique. So shinfin™ leg fins enhance the right muscles, in the right sequence, without giving you bad habits. This is why they are swim technique fins with significant evolution beyond all foot flippers. I have designed shinfin™ leg fins to match elite streamlined kicks for freestyle, backstroke and butterfly. Since about 1990, I have developed over 50 prototypes. Testing has included beginner and intermediate swimmers through to elite swimmers at the Australian Institute of Sport and in the Australian Olympic Team. Testing has also included physically and intellectually disabled swimmers. I have studied swim techniques with shinfin™ leg fins, with foot flippers and without any fins, using underwater video equipment and biomechanical analysis. Good and elite swimmers and swim coaches quickly recognise the natural, streamlined kick of shinfin™ leg fins and their swimming technique benefits. You feel how they help to keep your body horizontal for less drag. You feel how they guide you to kick from your hips, with only a little knee-bend. You feel your power coming from the big muscles in your upper legs, buttocks, stomach and torso. These are same muscles you use for good “no-fins” swimming techniques (without straining your feet, ankles and calf muscles like foot flippers). You also feel how they give the correct body balance to support your arm stroke. So you know your swim technique with shinfin™ leg fins is strengthening your natural kick – you can feel it. That’s why they also improve your “no-fins” swimming technique (arms too), stroke efficiency and speed. They are biomechanically advanced swimming technique fins, an evolutionary step up from all foot flippers if you want to improve your swimming technique. Most swimmers and coaches know that foot flippers corrupt your kick and change your whole swimming technique too. Foot flippers cannot work with proper swimming techniques (even if you cut them short across the toes) basically because they are connected to your feet. They stiffen and cramp your feet and ankles, and disrupt water flow. Foot flippers change your body position and your ankle, knee and hip movements, often to a “bicycle-kick” with knees bent too low. You can’t kick at your normal rate and you use different muscles. You know your swim technique is wrong because your body remembers the corrupt foot flipper kick even after you take them off. That’s why it takes a few laps of the pool without foot flippers, before your swimming technique feels natural again. Some coaches cut foot flippers short to try to improve them, but they are still connected to your feet so the problems remain. Other coaches refuse to use foot flippers at all for swimming training. For customer testimonials about people getting great benefits from these swim technique fins, please see Swim Technique Fins Reviews. To learn about how these fins also work very well for improving your swim training, please see Swim Training Fins and Swim Training Fins Reviews.